Did you know that 748 million people do not have access to a clean water source? The water crisis is an ongoing problem throughout the world that is being combated head-on by BLUE Missions Group. Specifically, throughout the year, BLUE builds aqueducts in remote towns that do not have access to clean water. Daniel Perez, an associate attorney at Cole, Scott & Kissane, P.A., has participated in these mission trips while digging trenches, laying water pipes, and bringing clean water to people that have never had such access. Cole, Scott & Kissane, P.A. 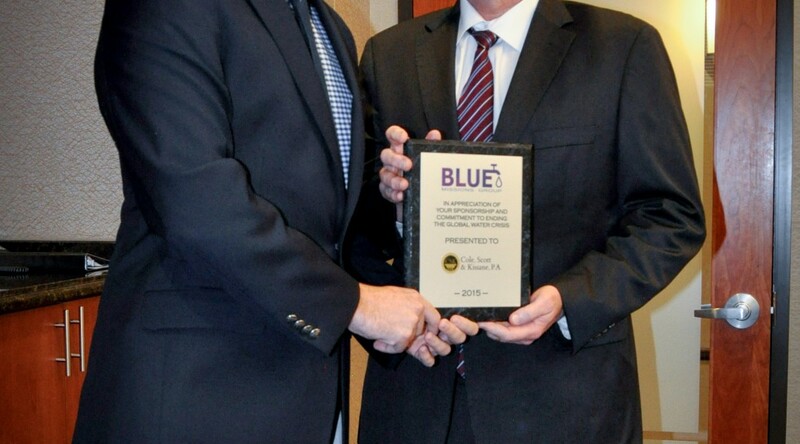 recently participated in BLUE’s annual gala, where over $50,000 was collectively donated to the water projects being performed by BLUE throughout the Dominican Republic. If you are interested in supporting the fight against the global water crisis, please join BLUE and Cole, Scott & Kissane, P.A., by visiting http://www.bluemissions.org for more information. Thanks to the generosity of the attorneys and staff in the West Palm Beach office, which was matched by the firm, we collected more than $1,700 this year. This year we supported two at risk-families under the auspices of the Children’s Home Society of Florida. These families needed the most basic necessities that we all take for granted – diapers, toiletries, and clothing. We were also able to purchase some toys for the children to make their holidays especially joyful. Children’s Home Society: Caring for kids since 1902 – Thousands of children, dirty, malnourished and alone, boarded the Orphan Trains near the turn of the 20th Century, desperately hoping to find families. Under the leadership of Reverend D.W. Comstock, Children’s Home Society of Florida was established in Jacksonville on November 17, 1902. With a staff of two, we found homes for 21 children our initial year, operating with a budget of $400. Less than a decade later, Marcus “Daddy” Fagg became State Superintendent, guiding us toward our unwavering leadership in the child welfare arena. Through our jeans days and generous donations from CSK attorneys and staff, we were successful in donating enough food and money for thousands of meals! We presented a check for $2000.00. The Miami office did participate in our work with Kids Can and Feeding South Florida with their own successful food drive as well. Feeding South Florida is one of 202 food banks comprising the Feeding America network nationwide. They are the leading domestic hunger relief organization in South Florida, serving Palm Beach, Broward, Miami-Dade, and Monroe Counties through a network of nonprofit partner agencies, including soup kitchens, food pantries, homeless shelters, group homes, and other emergency food service programs. 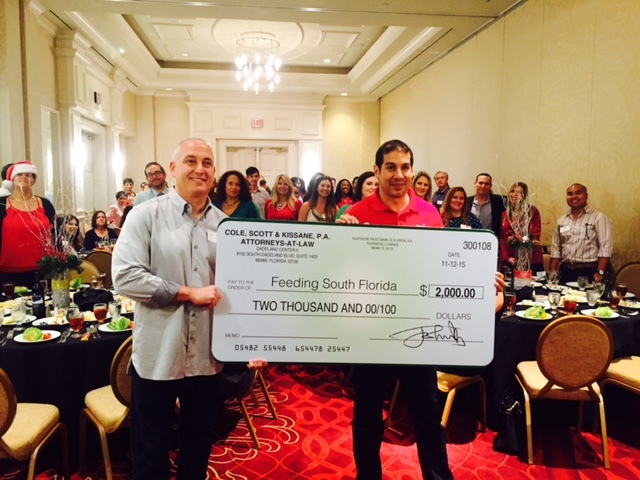 Photo above – Feeding South Florida President and CEO, Paco Velez (right), accepting our donation at our holiday party.